As one of the most potentially volatile industries, the oil & gas industry requires reliable encoders that meet industry standards. With ATEX Zone 0 and Zone 1, NEC Class I Div II, CE and CSA certifications, Dynapar’s NorthStar encoders offer advanced sensing technology and reliable solutions for Oil & Gas. Certified for use at -50• to 100• C, they are independently tested at up to 400G shock and 20G vibration. 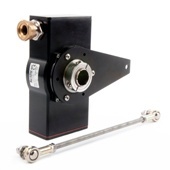 These unique encoders provide reliable output signal up to 1000 feet with high current driver and offer the industry’s toughest optical engine with unbreakable disc. For the corrosive oil and gas environment, our encoders offer to oilfield equipment manufacturers and end users enhanced sealing, industry certifications and an overall improved solution. They are used in drill motors, top drives, rotary tables, mud pumps, pipe handling, production equipment and more. 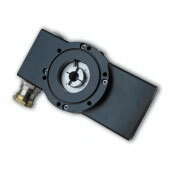 The DWD38 encoder is designed exclusively for drawworks applications on an oil rig. 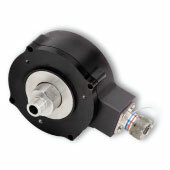 The NorthStar DWD38 is certified as an ATEX Zone 0 Intrinsically Safe encoder. The DWD38 has a temperature range of -40 to 100°C with a 400g shock rating making it ideal for the tough environment of the oil rig. The EN44 is ATEX certified for use in Zone 1 on the oil rig. A barrier is normally required for a Zone 1 application which can add additional cost to the solution. The EN44 isolated coupling compensates for motor shaft run out and endplay and the encapsulated electronics remove the need for a barrier.